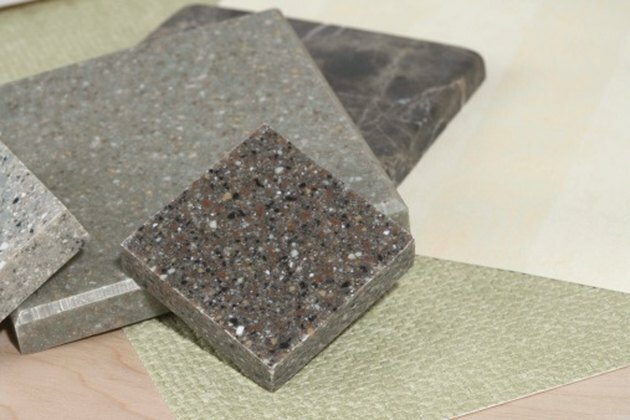 Natural stone is an expensive yet common option for many home remodeling and decorating designs. Used for tiles, walls and countertops, grime will quickly cover your stone item and require a thorough cleaning. Muriatic acid is a heavy-duty chemical that will clean away dirt, soap scum and efflorescence from your natural stone and masonry items. To prevent harm to yourself and those around you always read and follow all directions and warnings printed on the muriatic acid label. Limestone, marble and granite are just a few of the natural stones available. Protect nearby plants and vegetation by covering them with a plastic tarp. Brush the surface dirt and debris off the stone with a broom or scrub brush. Dampen the stone with a water hose. Wear a pair of rubber gloves and safety goggles. Fill a 5-gallon bucket with 10 parts cool water and 1 part muriatic acid. Dip a brush broom or scrub brush in the mixture and begin scrubbing the stone in a back-and-forth motion. Leave the mixture on the stone for 10 minutes before rinsing clean with a water hose. Sprinkle a liberal amount of baking soda on the stone and scrub with a clean brush broom or scrub brush. Baking soda will naturally neutralize the acid. Rinse the stone clean once again with a water hose.